As you may recall the Chairman’s Challenge came about after 3 of the Committee supported their partners/husbands through major health treatment and as it strikes such a cord of gratitude the idea came about that it would be good to give something back! I choose to speak to Lister Hospital because that is where John, my partner, had and continues to have his fantastic support. Following discussion, the Committee liked the idea of a wall hanging for the main concourse (which is currently full of cancer posters & virus prevention notices – oh so drab, and un-inspiring! ), whilst the hospital thought the new Chapel would be a wonderful location. Recently, Sue D and myself visited the Director of Nursing, and we also met one of the Chaplains. It became apparent during discussions that the main concourse was not currently appropriate as it is getting a make over in the not too distant future, but no ideas of design have as yet been formulated. Also there is the issue that any wall hanging would have to be behind Perspex to protect it from visitor damage (yes there are angry people) and any virus which, if discovered in the area, would mean its certain destruction. 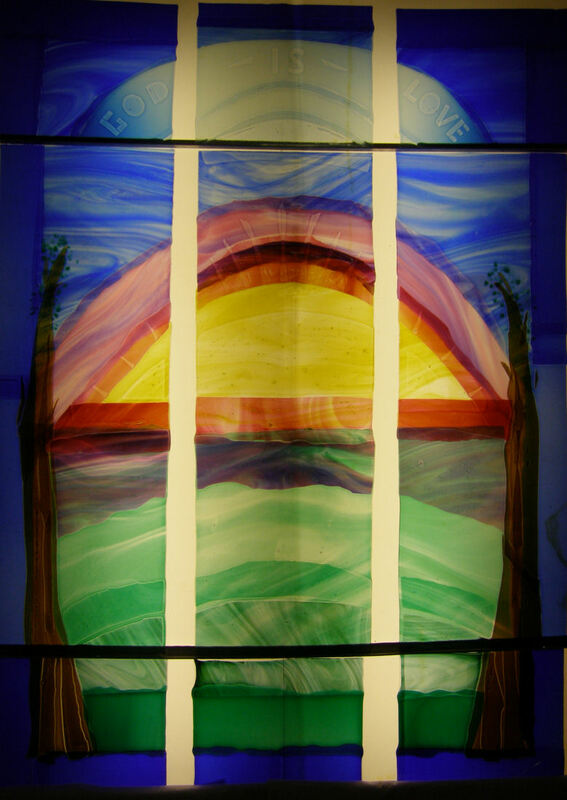 We have therefore agreed with the hospital to do a wall hanging for the new inter-denominational Chapel complex. 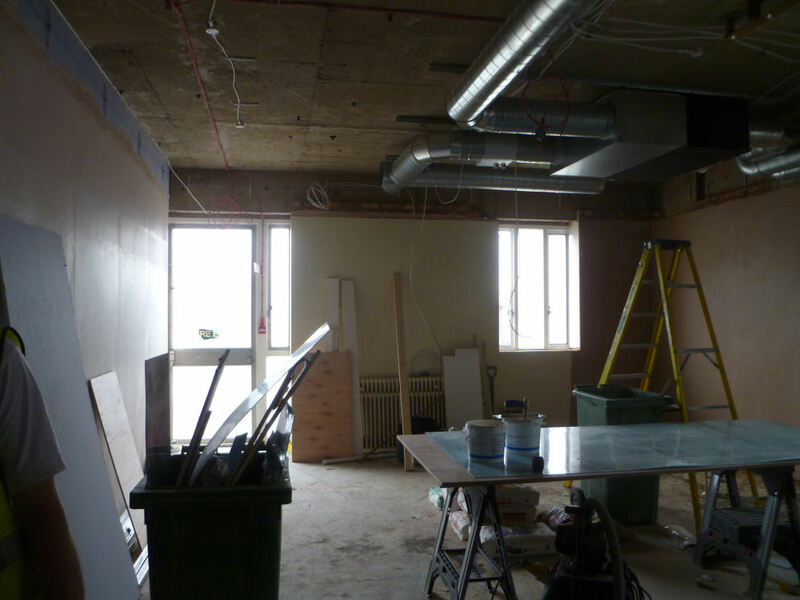 It is being built, as we speak, out of another current section of the hospital which is much nearer to the main concourse, and will provide easier access to those using it. There is a quiet room, toilets, a room for the Chaplains, and the main Chapel. We managed to see the room, (despite building materials everywhere!) which as you look in through the main door has a window to the right where the stained glass window is going.A wall straight ahead flanked by a small window to the right and an emergency exit to the left. 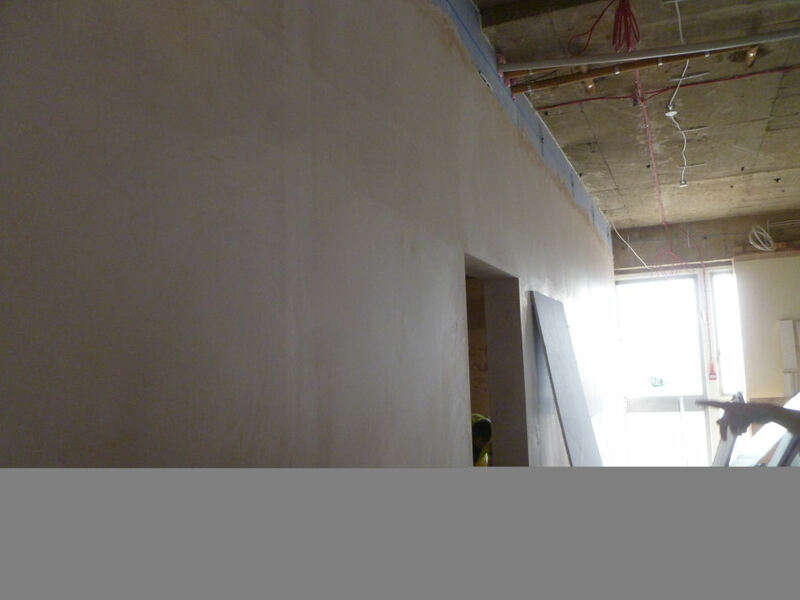 This is the wall were our hanging would be – straight opposite the main entrance so it would be the first thing you see. The back wall opposite this will have the dais, and the remaining long wall contains the door to the Chaplains room. The long wall was an option, but we liked the fact that our wall hanging would be the first thing you see. The Chapel is used quite a lot by staff and for services, so it is not a place that quietly gathers dust! The stained glass window is not large, and has been made by a local artist, Tessa Verrecchia who lives at Epping Green near Hertford. 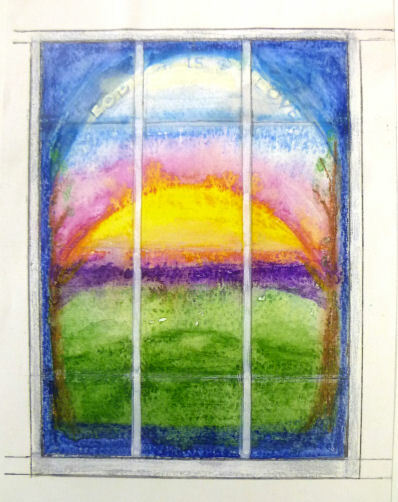 The window is in three panels and is made using glass she has fused through heat, rather than the traditional pieces being held in place by lead. The three panels will be supported by a lead surround so there will be some tradition! It therefore makes sense that our wall hanging is in three panels to emulate the window. So that is our aim when we come to the construction of it, and to perhaps use a blue fabric to edge the panels. (The hospital are also thinking of possibly using a blue coloured fabric for the chairs). We still have to use fire retardant fabric for the backing! We are giving everyone a 6″ square of linen which has a rather nice slub in it. This is to be used as the foundation fabric to produce your 4″ square (that is, please leave a 1″ border on this linen all the way round your design for us to use as a hem/means of attaching to the final background fabric). So you can back it with calico to provide strength for your embroidery, you can use it as a mounting fabric to appliqué to it a piece of embroidery. Again, the choice is yours. We have more squares thanks to Sue Dunkerley’s tireless efforts in cutting them up, so if you haven’t got one yet or are unable to attend a Branch meeting let me know and I will post you one. If you want to do more than 1 square absolutely fantastic – the more the merrier! We have already chosen ‘Hertfordshire’ as our theme for the 4″ squares. Anything to do with Hertfordshire – a piece of architecture, an animal, flora or fauna found in Hertfordshire, a village sign, a symbol, a map etc. We have kept the topic broad so it gives freedom of design. Regarding use of colours – it would be brilliant to use the colours of the stained glass window as it would then co-ordinate beautifully. Briefly the colours are: Pale black coffee, Bristol blue, light blue, mid/dark blue, mid/dark grass green, grass green, olive green, raspberry pink, warm pink/mauve candy floss, and antique gold. 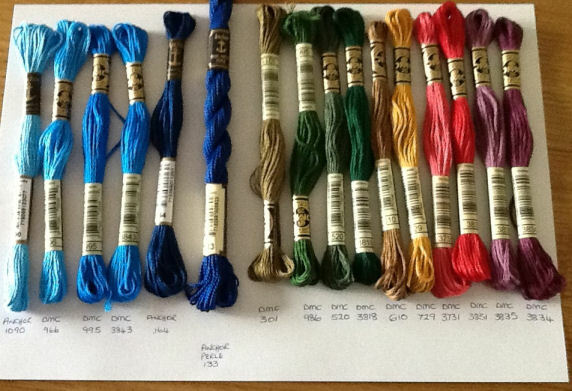 If anyone wants some actual thread bits of these colours let me know and they can be posted or collected from a Branch meeting. 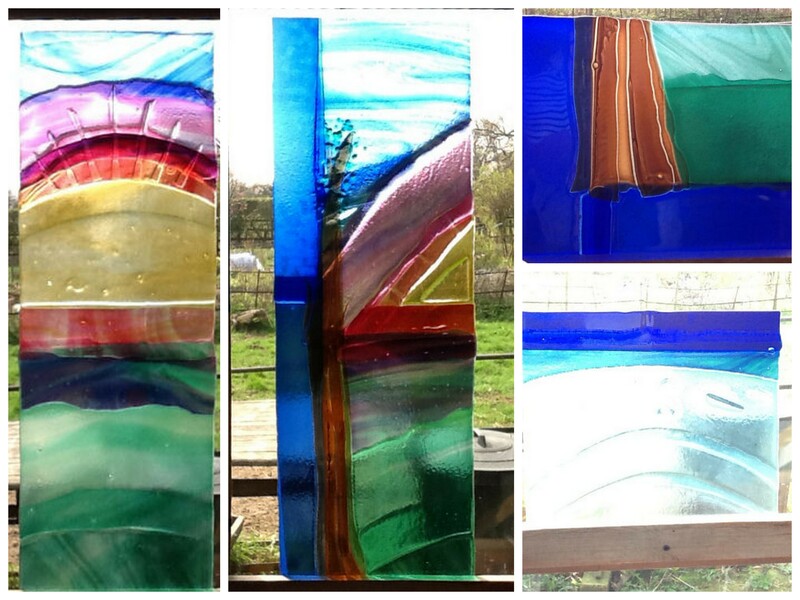 We will have a mood board at our meetings showing the glass pieces, threads & pictures for all to see. We are therefore asking if you can use a minimum of 1 of these colours in your square. If you would like to use more – fantastic. We have decided that a good time to have your completed squares back to us are by our meeting in October – Friday 4th October 2013. The thinking behind this is that we know members are already working on their Nora Jones pieces and we do not want to clash with that, there is an SOS in August to help with both projects, and it means we do not clash with Nora Jones entries for September 7th. If you wish to hand in your square/s before the 4th October, please feel free to and we will keep them safe. We will obviously need some time after the 4th October to mount them into the final wall hanging and be able to show you the results of this great Branch project. I was up at Heartwood Forest in Sandridge taking photos of the bluebells last week. Having seen the colour palette for the challenge today I think I will base my piece on this. Your carved images sound interesting…maybe they could have colourful shadows around them? This has led me to think that perhaps I should also embroider a square relating to St Albans History….there is certainly plenty of it! a mere couple of thousand years of history should give you plenty of scope! 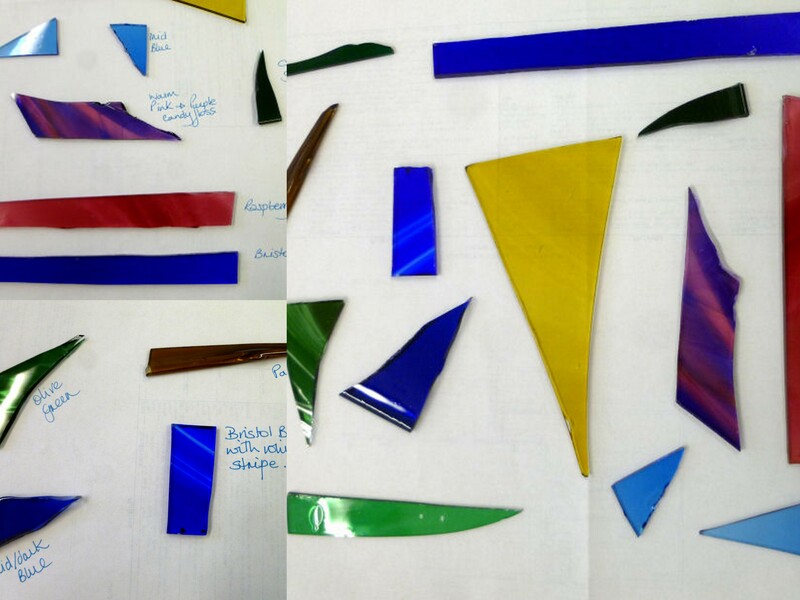 I have been inspired by the bluebells in Hitchwood which have been fantastic and make use of the blues and greens in the stained glass window. 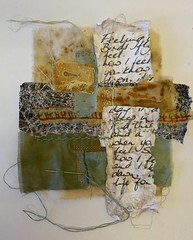 I am also going to attempt a second piece with daisies as I just love them and my last house was called Daisy Cottage!